In order to self publish a high-quality book that appears professional and goes on to be a best seller, you need a great editor. But editors don’t come cheap. And when you layer in all of the other upfront expenses you need to launch a great book, the price can be daunting. So how do you get creative and keep your expenses in check while keeping professional-grade quality? Did you edit your book yourself? Yeah, we can tell. Did your spouse, brother, or virtual assistant edit your book? Yeah, we can tell that too. So to self publish a professional-grade book, you must have a professional-grade editor. I don’t know if you’ve shopped around for one, but they are freakin’ expensive! When done properly, self publishing a book is a great side hustle that can deliver passive income and cash flow for a long period of time. I have some earnings figures and benchmarks here in my article how to write a book and make money. And what if you want to do an Audible version too? Can you hear the cash register sound clanging with each word? It’s easy to spend thousands of dollars on putting together a “done properly” book. I did with Leave the Grind Behind, but it paid for itself very quickly. But when it came to editing, I was very skeptical of the services on Fiver and Upwork. Plus they were expensive. I had a couple of referrals from my network, but they were extremely expensive and their track records weren’t impressive. Googling for professional editing services was frightening. Editing prices are justifiable. A proper edit takes multiple passes and a highly-knowledgeable person. High skill * time intensive = expensive. Thanks to my networking and masterminding, I had someone in my circle who has been wanting to start a side hustle and who LOVES FREAKING grammar. As he puts it, he was “born with a grammatical spoon in his mouth.” He has an English degree, but isn’t doing anything with it professionally. He loves editing and is great at it. Odd as it may be, it doesn’t seem like work to him. And that’s the best side hustle idea for anyone! You find something that doesn’t feel like work and you get paid for it. So he’s looking to break in to editing. He’s legit…professional grade. And he’s smart. He wants passive income and cash flow. He wants to build his future. We have similar goals. So my first best friend (networking) got me here. My second best friend (partnerships) sealed the deal. 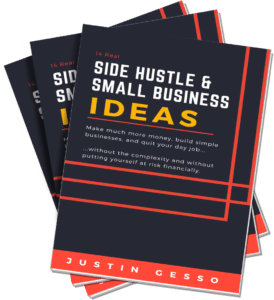 I am big on forming small business and side hustle partnerships because you can achieve your goals much faster with less risk. And that’s what this editor and I did. We formed a publishing partnership. We each earn a percentage of sales. Simple. You can agree on the percentages. You can have earnings caps. You can structure it however you want. My book was professionally edited and I didn’t have to risk a bunch of money upfront. We both like the passive income. We have another book coming soon and will follow that with a series of short books. And one of the biggest wins is he successfully launched his editing side hustle. 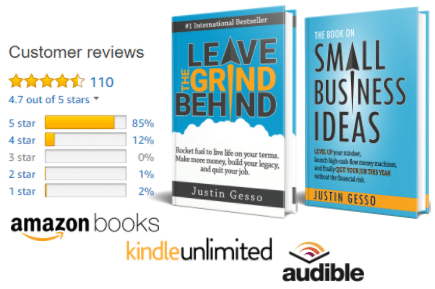 Within a year of editing Leave the Grind Behind, he used some of the principles from it and landed 8 other book editing jobs (all paid a flat fee). He also landed an ongoing editing gig with a major blog. All told, he earned solid 5-figures on the side doing something he enjoyed. Big win. How have you creatively financed your side hustles?